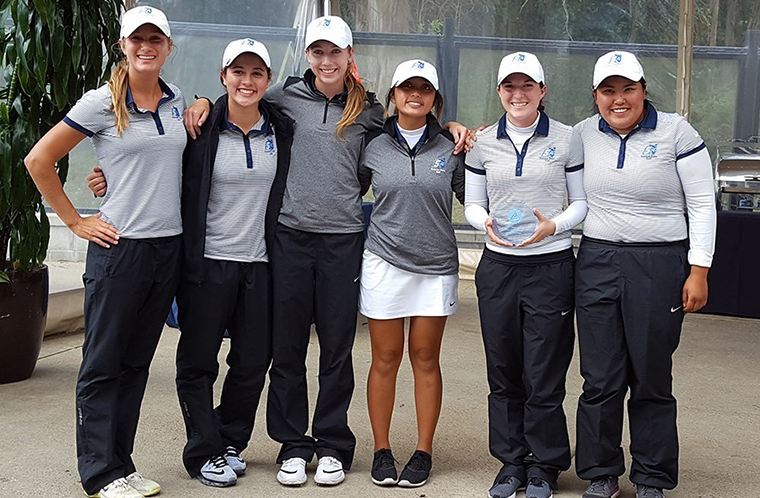 Haley Whitbeck fired a seven-over-par 153, including a second-round 75 on September 13 to finish second and lead the Sonoma State women's golf team to second place at the inaugural Art of Golf Classic at Presidio Golf Course in San Francisco this week. Whitbeck carded a 78 on the opening round and ended the 36-hole event just three shots back of individual medalist Crystal Wang of host Academy of Art. Sara Van Wagoner fired a long range missile from the right corner of the penalty box that found the left upper corner of the net in the 13th minute, then Katie Mohr took advantage of a defensive miscue and banged a shot off the left post and into the goal in the 56th minute to account for the Sonoma State women's soccer team's 2-0 victory over Cal State San Bernardino on the hot, sunny September 18 afternoon at the Seawolf Soccer Field in Rohnert Park. The Seawolves have won four straight matches, rising to 4-1-1 overall and 2-0-0 in conference play. After 70 minutes of scoreless play, Katie Mohr found the back of the net after a cross by Taylor Enzler got punched away by the goalkeeper for the first goal of the game, then Bella Amyx added some insurance nine minutes later to secure the Sonoma State women's soccer team's 2-0 victory over Cal Poly Pomona on September 16 in the CCAA-opener at the Seawolf Soccer Field. The Sonoma State men's soccer team welcomed CCAA opponent Cal State San Bernardino on September 18, and a late goal by the Coyotes in the second half lifted the visitors over the Seawolves, 1-0. Sonoma State fell to a record of 1-2-3, and a record of 1-1-0 for CCAA league play. Josh Sanchez converted a penalty kick in the fourth minute and Armando Coronel added a very important insurance goal 25 minutes later as the Sonoma State men's soccer team held on to upset No. 23 Cal Poly Pomona, 2-1, at home on September 16 in the CCAA opener for both teams. This victory earned the Seawolves their first victory of the 2016 season. The Sonoma State Seawolves were victorious in San Francisco for their CCAA opening match against the San Francisco State Gators on September 17. Sonoma State at one point held a seven point lead, and the narrowest the Gators would close that lead to was four. They swept the match in three sets 25-18, 25-21, 25-18. Justin Shluker fired rounds of 75, 73 and 71 to tally a 54-hole total of 219, a six-over-par performance to finish in a tie for fourth place. This led the Sonoma State men's golf team to second place this week in the Dr. John Johnson Invitational hosted by Cal State Dominguez Hills at Industry Hills Golf Club at Pacific Palms on September 20.